Sometimes, steady can be a good thing. While real estate in the Highlands and Cashiers area has shown slow growth, that may be the best growth. May 2017 did not show any growth as compared with May 2016. In fact, the volume was actually down while units sold remained the same. The drop in volume was due to many lower priced homes being sold. The median price had actually dropped to its lowest in a while at $220,000. So, how did the real estate market do? Total homes listed in Highlands/Cashiers MLS: 1190 – This is an increase of about 100 homes from April. Many more homes come on the market in the summer months, which also means Sellers need to be very competitive. 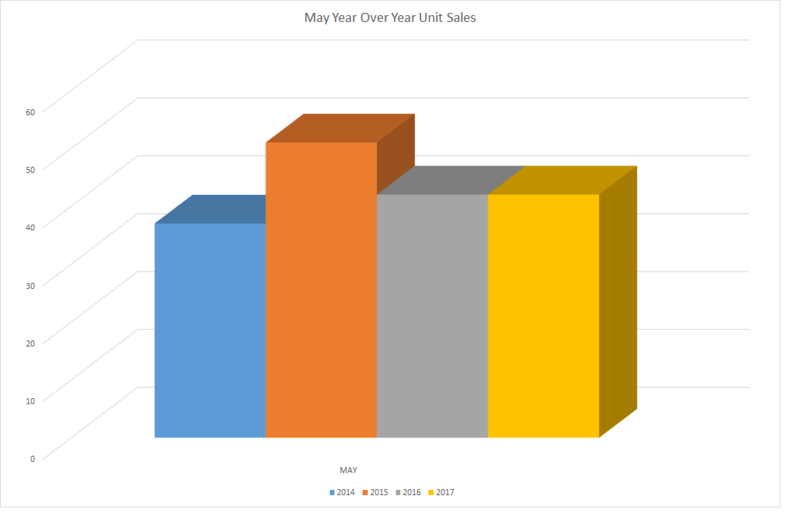 Homes Sold This Month: 42 – This is the same as May 2016. YOY Inventory: 22 months – A very high inventory. Prices continue to be held low. Average DOM: 508 – This is somewhat typical for this area. Median Sales Price: $220,000 This is the lowest in over a year. While this is not the average selling price, it does show where the middle of the market rests. In other words, there were just as many homes sold above and below this price. Average List/Sell Ratio: 88.94% – Most Sellers had to come down from their listing price to get sold. The fault with the theory to List High/Sell Low is that homes that are more accurately priced stand the better chance of selling and being shown. This shows that almost all homes need to lower their price to be in a competitive market. Land Units Sold: 19. This is a nice jump, but less than 2% of all the land that is available. Inventory: 5 years. This is an extremely high inventory. Land values will be held low with this much inventory. There are simply too many homes and land available to justify development of land. Synopsis: Land is probably at its lowest prices in over a decade. Some land is the lowest this broker has seen in about 30 years. While there is some building going on in the area, most of this is from land owners that finally began construction on property they have owned for many years. 42% of home sales ranged from $200,000 to $499,999. 7% of sales were above $1,000,000. Where Are You? 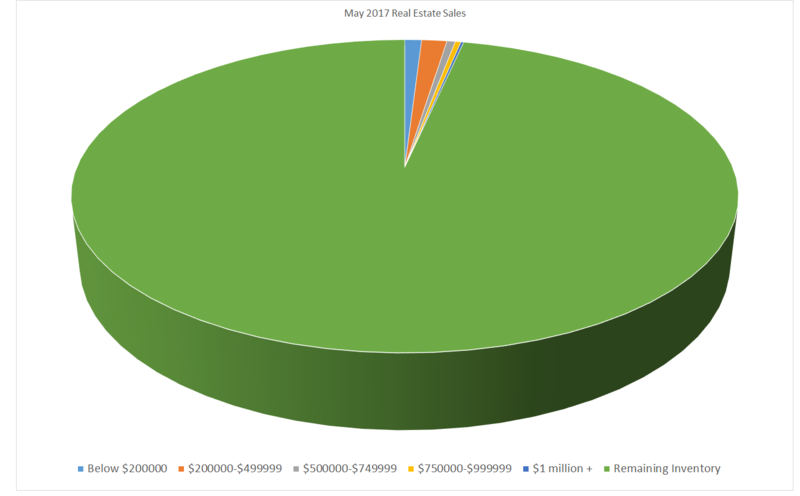 In looking at this chart, the total area equals the number of homes on the market that are for sale. The colored wedges represent the homes that sold during May according to their representative colors. Those wedges (slivers) represent the percentage of the market that has sold. Already, there are narrow margins to sale. To increase the opportunity of a sale, you must be priced correctly or very competitively. SELLERS: Take the sale of your home serious. Look at it from an appraisers point of view. Have your broker give you a Comparative Market Analysis. DO NOT compare with what’s for sale, but with what has sold. This will give you the Buyers perspective. The majority of homes that are selling are those near the town of Cashiers or Highlands and in Sapphire, where there are amenities. Most Buyers are seasonal occupants and desire to be close to town or have other enticements. Homes in outlying areas are not as highly favorable. To compensate, pricing must be a factor. To see the areas with the most home sales CLICK HERE. You will notice the areas highlighted in Yellow. The far left column of those highlights shows the area where those homes were sold. You can look at all the areas in the Highlands/Cashiers MLS to compare where you may live. Sapphire and Sapphire Valley are lumped together as they are often considered the same area. Outlying areas such as Cullowhee (which covers the North and West sides of Lake Glenville), Big Ridge, Norton, Mill Creek, Big Ridge and others show considerably less sales. This is because Buyers want to live in the mountains, but desire services such a grocery, hospital, etc to be close by. On the Market now, or as soon as possible. Be priced competitively so as to attract Buyers. The real estate market in this area is unlike almost all real estate markets. One should not assume because things are doing “this” or “that” elsewhere, that it will do the same here. You need a REALTOR® that is from the Highlands/Cashiers area and that knows this market. There are many Brokers serving this area that come from other locations and basically serve this area seasonally. Because these Brokers do not live here year round, they do not actively market their clients homes during the winter months. This past winter saw an increase in home sales as compared to previous years. In fact, this Brokers inventory was drastically reduced, which bring us to our final point. Sellers Listings Needed: Because of having such a good winter in home sales, I am in need of more Listings. If you or someone you may know has been considering the sale of their home, please contact me right away (828) 506-0011. It takes time to evaluate market value, take pictures and video and get marketing started. Share this post with your family and friends so they may get it to someone who would like to List/Sell their home. The Highlands/Cashiers Real Estate Market has shown some progress. It has a way to go before it could be considered a “hot” market. Still, positive signs are emerging.